Industry 4.0: wood also has a part to play! As part of Luxinnovation's cross-sectoral initiatives, two clusters (Wood and Materials & Manufacturing) joined forces together with their members for an afternoon of discussions on the topic of Industry 4.0. An event joined by the Luxembourg ICT Cluster in the very transversal role of digitisation. Forty companies of all sizes (SMEs and large groups) took part in these brainstorming workshops. This was not only to explain and spread the notion of Industry 4.0 in the workplace, but also – and above all – to connect the dots in terms of the development of the wood sector (improvement of prefabrication processes in wood construction, optimisation of internal processes through digitization and material flows and stocks, etc.) to existing Industry 4.0 services and techniques in Luxembourg and the Greater Region. 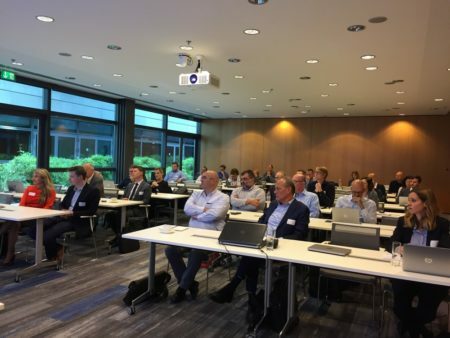 After a presentation of Industry 4.0’s “Philosophy” at company level by Philippe Osch (CTO, Hitec) and Guy Kerger (CEO, Mindforest), real life cases of developments in industry and SMEs were presented. Bruno Marniquet (Ampacet) also addressed the question “Where to start with digitisation in logistics?”; Thierry Van Ravestyn (Up-trace), for his part, focused on the theme “Traceability and Industry 4.0 also in the wood sector”, while Carlo Posing (RMS.lu) evoked the subject “IOT and the wireless connected and battery free home “. “An Industry 4.0 project is a company project and not a project of one person,” said Guy Kerger. For companies present, , digitisation is precisely a key issue for three areas in particular, highlighted by a survey conducted “live” during the afternoon discussions. 89% of respondents see this digital transformation as an opportunity to optimise their processes and their productivity; 84% see an optimisation of planning and forecasting and 74% an improvement in quality. The purely “technical” aspect is therefore far from being predominant. To achieve this, a major challenge needs to be met: the training of employees to better understand the impact of transformation (79% of survey responses). The development of a solid business strategy (53%), the digitisation of administrative processes (42%) or production processes (37%) are lagging behind. The implementation of Industry 4.0 is definitely not just a technical implementation of solutions, but it must be accompanied by an acceptance and understanding by all employees in the company, which can only be accomplished through adequate training. The mission of Luxinnovation and the Clusters is obviously not limited to possible interactions between just the timber industry and other sectors. The success of the implementation of Industry 4.0 at any level, is also, of course, through a pooling of knowledge and experience sharing on a wide a basis as possible. Would you like to join the Luxembourg Wood Cluster or the Luxembourg Materials & Manufacturing Cluster? Luxinnovation contributes to the economic development of Luxembourg by fostering innovation, fuelling international growth and attracting foreign direct investment and is supported by: Ministry of the Economy, Ministry for Higher Education and Research, Luxembourg Chamber of Commerce,Luxembourg Chamber of Skilled Crafts and FEDIL – The Voice of Luxembourg’s Industry. The General Assembly of the Luxembourg Materials & Manufacturing Cluster held on 28th February, highlighted its intense activity. Several initiatives were presented to boost this important sector of activity in Luxembourg which will be spotlighted in a few days at the JEC World 2019 fair in Paris. The Luxembourg Materials & Manufacturing Cluster is organising its annual general meeting this 28th February. A good opportunity to take stock of its activity, not only with its members, but also with other representatives of the sector, who are invited for the occasion.